Michael Angelo’s is celebrating National Italian Heritage Month in October, and there are a few ways you can get in on the excitement. First, you can take yourself on your own Italian dining experience by picking up a frozen meal from Michael Angelo’s Gourmet Foods. You have the choice of individual or family size meals. Founder and CEO Michael Angelo Renna and his mom Sara are obsessive about quality and authenticity, sourcing the best ingredients from Italy and around the world. They make meals just like the home cook or restaurant chef without relying on the common fillers, flavors or preservatives found in most frozen foods. I gave Greg the task of picking out our meal and he brought home the family-sized Eggplant Parmesan. Full disclosure here – the 30 ounce box has about 5 servings in it. I opted to eat two servings because I didn’t think I’d be full on just one. Greg was able to eat what remained and was probably still hungry. Regardless, it tasted great – not like something that came “from a box” (and I have a high standard when it comes to Eggplant Parmesan, trust me). The reason we probably could have had more from a family serving was probably a combination of the taste and the fact it wasn’t as carb loaded as many Italian meals are. Once you let it cool down, definitely dig it – it’s delicious. And cheese-filled heaven. Micheal Angelo’s is also having a sweepstakes for you to “Taste Your Way to Italy”. One grand prize winner will get an eight-day trip for two through the Taste Your Way to Italy sweepstakes. This will include a stay in a private villa with the Michael Angelo’s family, a tour of the region, and an exclusive event at Castello Banfi. The sweepstakes is open now through November 24, 2013 via entry on their website. Extra entries can be earned by joining the Michael Angelo’s Family Table reward program, earning points toward additional sweepstakes entries with each Michael Angelo’s meal purchase. So, time to celebrate National Italian Heritage Month, all while giving your belly something to be happy about, too. Divertiti! Enjoy! 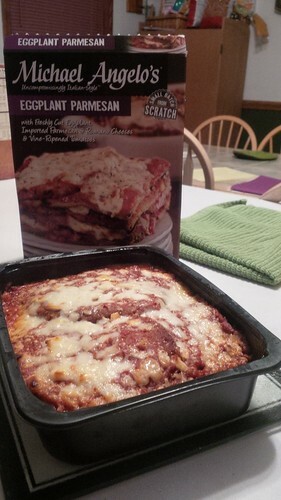 This entry was posted in Dinners, Product Reviews and tagged dinner, frozen meal. Bookmark the permalink.